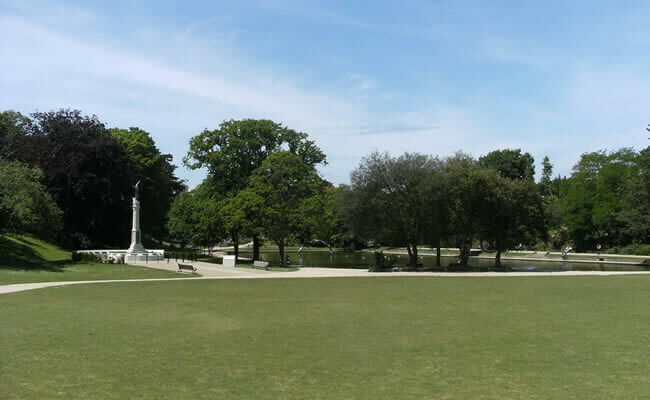 The town's main War Memorial is in Alexandra Park, near to the Bethune Way entrance. The memorial is the main focus for remembering those who gave their lives as a result of enemy action as a result of the two World Wars and campaigns since. The memorial was first designed by Margaret Winser (a pupil of Rodin) in 1922. It consists of a bronze winged figure at the top of a limestone column and bronze panels depicting soldiers in action. The memorial carries a number of bronze plaques containing the names of those who died in action in the First great War (front faces) and Second World War (upper faces). The memorial was dedicated on Sunday 26th March 1922. The names of those who died in World War 1 are also displayed on panels at the top of the main staircase in the Town Hall, Queens Road. Another significant war memorial can be found just east of the pier on the promenade; this memorial commemorates those that died in the South Africa campaign 1899-1902. The monument in pink granite contains the inscription: 'Erected by the inhabitants of this Borough to the memory of their brave fellow townsmen who fell in the South Africa War, 1899 - 1902'. At Hastings Cemetery there are two areas set aside for war graves.